Maschine Mk3 now with sound and vision. Native Instruments are not messing about here, the new Maschine Mk3 now features a high quality internal sound card and dual high resolution displays. Apart from the new layout and new ‘flat’ buttons, the Maschine Mk3 has two massive (pun intended) improvements. As with the new Komplete Kontrol S49 and 61 keyboards they’ve added the twin displays found in their flagship Maschine Studio. The displays are great for browsing the huge library of sound and instruments and also for tweaking sounds and editing tracks or samples. The Maschine Mk3 can sample! 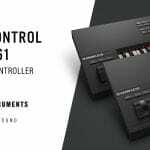 This is the first Maschine controller to have a built in audio interface, and it’s a good one too. The sound card can produce 96 kHz / 24 bit audio out of two balanced TRS outputs and it has two TRS inputs and a mic input for sampling. Other connectivity gives you MIDI in /out, 1 foot switch socket and a headphone output with its own volume control. The Maschine Mk3 can be mains or bus powered (USB2.0) to give you true portability. As with all Maschine controllers the Maschine Mk3 ships with Maschine software and Komplete 11 Select giving over 32gb of sounds, effects, instruments and more. 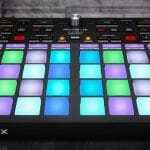 Maschine Mk3 will be available soon and can be pre-ordered now.